The book has four parts. The first part includes literary-theoretical definition of realism as a stylistic formation; realism in Serbian literature and place Ilija Vukićević in the Serbian realism. The second part of the book is given the ratio literary critic Jovan Skerlić to literary creation Ilija Vukićević. There are biographical and bibliographical information on the author, then a literary influence and comparative analysis of stories with Frontier themes and Ilija Vukićević and writers from Kosovo and Serbian History. In particular, the author of the book remained on the Ilija Vukićević as a precursor Bora Stanković and Radoje Domanović. This is done, probably because of this writer, who lived and worked for some time in Vranje, little is known. The third part of the book includes the presentation of stories from the life of a border: Border Guards, Škrbo and Fejzula, Miško Ubojica, Under the Sun, Angry wounds. They emphasized the themes of these stories, especially the characters are well presented, composition, style and means of expression and language, as well as messages and ideas. 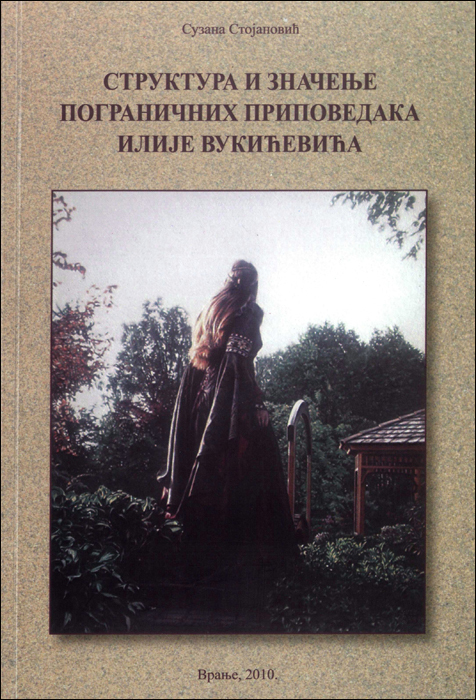 Through the analysis of the above stories Suzana Stojanović showed that the frontier stories of Ilija Vukićević discover new themed content in the Serbian prose. According to Dragiša Živković, all of these stories have anthological value. In them, the writer finds his literary path and image life border guards on the new border with Turkey, south of Vranje in the period from 1890 to the 1896th. In these stories is particularly interesting points to end harsh mountainous and highland atmosphere, unusual people, often very funny and impetuous. The author points out that the writer spoke with a lot of sympathy for these people and it deeply go into their soul. It was pointed out that a successful writer photo nature, but it is well understood and that the frontier stories of Ilija Vukićević are locally colored, which is not the case with his earlier stories from rural and small-town life. This part of the book, among other things, points to a similar stylistic procedure in the construction of stories that they contain not only unusual characters, but also the dramatic conflict and that their action is accelerated. It also stated that fighters in the stories are patriarchal and honest people, but many times the urge introduced into bloody conflicts, and paying honor life. Their love is strange, murderous, brutal and instinctive. For these reasons, unlike Glišić, Lazarević, Matavulj, as pointed out by the author, stories of Ilija Vukićević act as exciting pictures of exotic places and one of them the new prose in Serbian literature in the last decade of the 19th century. All these findings are illustrated through a detailed analysis of the above five stories from the life of a border. The author has proved to be very ably served the selected primary, secondary and special literature. However, in the manuscript the books came to the fore its own study of border stories of Ilija Vukićević, as well as its entire work. This is particularly noticeable from the pages of stories analyzed.